Ciao! 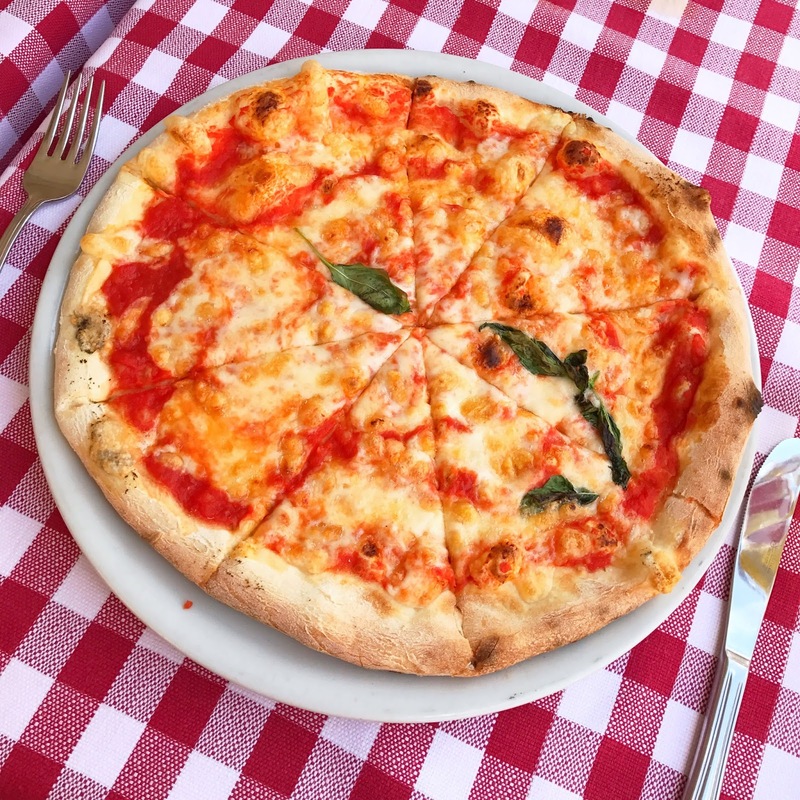 I am excited to share with you the second half of our Italy trip. Traveling to Capri can be a bit tricky for first time visitors. Since it’s an island, you have to be a bit flexible within your travel arrangements. Through our hotel at Palazzo Avino we had made arrangements for a car to pick us up and drive us down to Amalfi where we could catch the ferry to Capri. The sea happened to have been so rocky that day that the Amalfi port was closed. This meant we had to drive about an hour (pasting Positano again) to get to Sorrento which had a much bigger port and the ferry boat could get in and out safely. It’s one of those things I would say, that traveling to these remote places, you have to be easy going with your schedules and you have to be prepared to have some extra money within your budget for changes that may cost more. Once you arrive in Sorrento at the Ferry port, you simply just get in line for your destination and purchase your tickets there. Make sure you have a few extra Euros on you to pay for any luggage you have as that is something you have to have on you when you actually get on the boat! The ferry ride was about thirty minutes and when we got off the boat in Capri, there was someone from our Hotel, La Scalinatella Hotel, waiting to take any of the guest luggage up to the hotel. This was super nice and convenient as Capri is situated up on a massive hill. You actually have to take an incline up to the top of the mountain which is where the majority of the town is. It would have been a hassle to lug the luggage up these stairs to get onto the tram and then to pull them to the hotel. Our place where we stayed as out of this world beautiful. We made friends with the staff and I hope one day I can return with Pat! This is the view from our Hotel’s balcony, isn’t it incredible?? If you are traveling from the Amalfi Coast to Capri, then you certainly will have at least half of a day on your arrival to explore Capri a little bit. 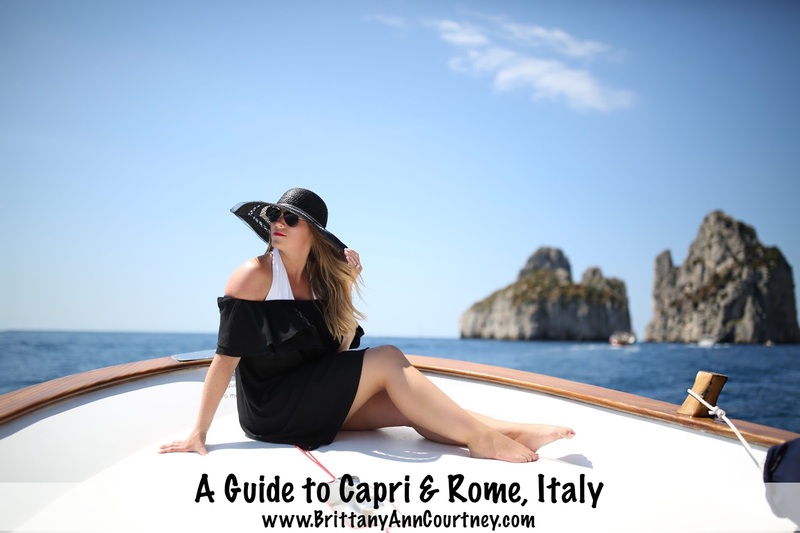 There are plenty of things to do in Capri for a week, even two weeks if you wanted to spend longer here! Capri is a luxurious island filled with high end shops, boutique hotels, delicious restaurants, beautiful gardens, etc. 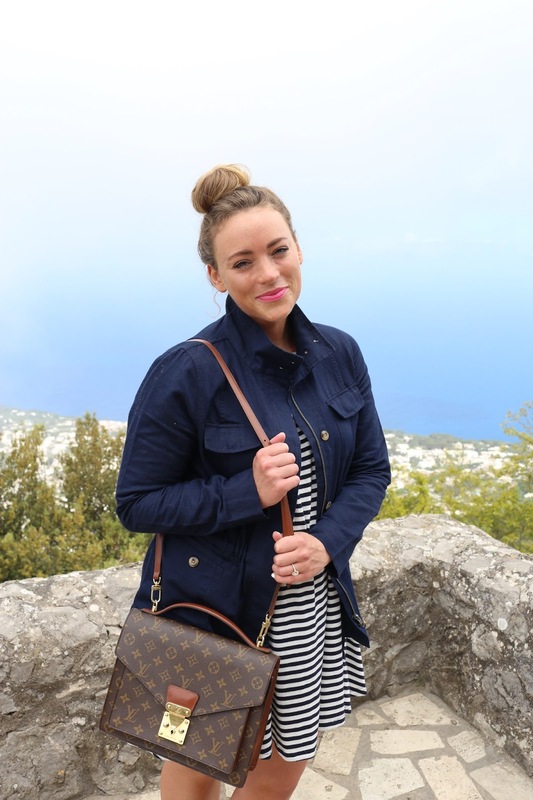 We spent our first full day walking around the island, shopping, trying different pastries, taking in the view. I was obsessed with all of the flowers that grow up the walls! See this gingham dress’ full post here. This is the view from walking down the path of our hotel, there is this little hidden bath that we find that walks you through the trees a little then opens up to this view! If you are staying somewhere with a pool, I suggest you take a day to relax and lounge by the pool! The weather happened to be a bit chilly when we were there so we didn’t layout by the pool but an afternoon drink near the pool to take in the view was relaxing enough! 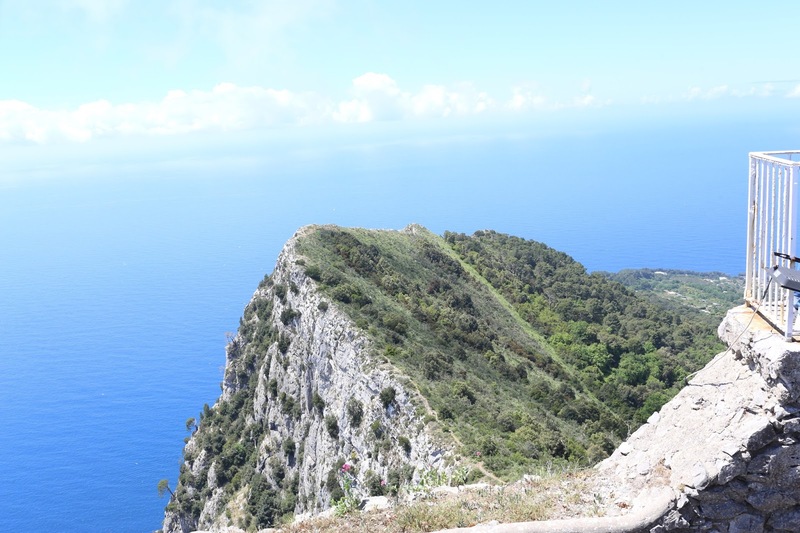 On one of our days we took a bus from Capri to Anacapri and rode a chairlift up to the very top of Mt. Salerno, the highest point of Capri. The view was absolutely out of this world. At the top they have a little snack shop with tables and chairs for you to sit and enjoy a little bite to eat. When you have had enough, you can simply take the chair lift back down and then get on a bus or walk around and explore the town center. Another day should be spent enjoying the sea at La Fortinella beach club. It’s one of Capri’s famous beaches with its blue and white striped umbrellas. The day we had planned to visit here, the water was too choppy and a bit windy. We were still able to rent a boat for a few hours. We rode around the entire island, going in and out of different caves and grottos! It was wonderful! We had our hotel arrange the boat tour for us, which made it super easy! The photos from this day are in the below!! On one of your days, you must treat yourself to a delicious lemon granita from the cutest lemon stand in Capri. 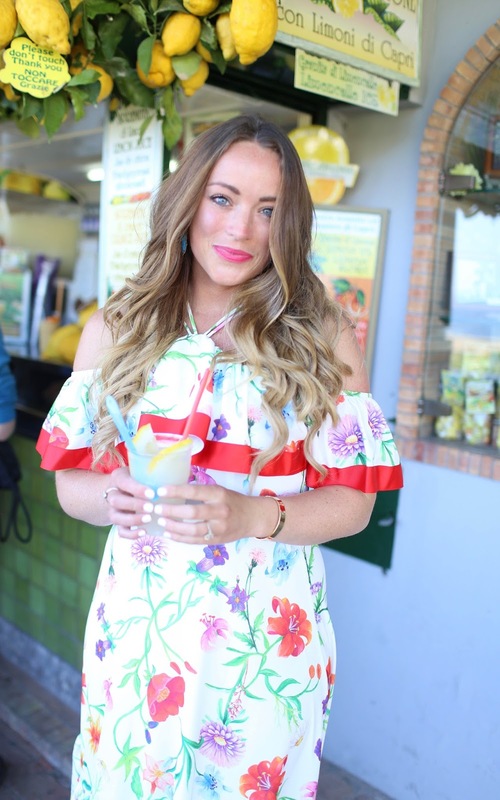 The lemonade stand is located behind Piazza Umberto, near the Caesar Augustus Gardens and is famous for its lemon granita mixture- the one I am drinking in the below! We spent one of our evenings eating at Capri’s famous Lemon Tree Restaurant. It is exactly what it seems like, you eat under a million lemon trees, enjoying the limoncello, eating a wonderfully prepared meal. One of the best places we ate at Capri, it was so delicious. We chose the unlimited dessert (our last splurge in Capri) and we were taken into a separate room where the counters were filled with all different kinds of pastries, croissants, desserts upon desserts. It was well worth the expense, it was incredible! See this dress’ full post here. We had to try not to cry saying our good byes to Capri. I loved it there, absolutely beautiful, out of this world! We took the ferry to Napoli and then had a cab drive us to the train station. From there we took the train to our final destination, Rome. Once we got into Rome, we had an uber take us to our last apartment we were staying in. It was located three minutes from the Spanish Steps and Via del Corso, one of Rome’s longest streets that winds through the city. Also, only a matter of a few minutes from Via dei Condotti, Rome’s prestigious high end luxury shopping street. The below photo was taken on the Spanish Steps! See the full post here. We spent a morning venturing over to the Colosseum. It’s one of those touristy things you just simply have to do! You have to take the time to do it because it’s absolutely one of those things you have to see with your own eyes! I have been to Rome before so I was super excited to go back to Piazza Navona. It’s just a magical little corner of Rome. I can’t explain why I fell in love with this square so many years ago, but when I was there again I felt the same overwhelming sense of joy and happiness. I love that there are musicians playing at night and the whole square is lined with cute little restaurants. We sat outside and had one of the best pizzas I have ever eaten in my entire life! I really like Rome, but for me it’s a two day tops kind of a place. Everywhere you go, there are just a ton of people. I like getting lost and finding my way back versus being guided through a city because of the amounts of people. It’s super beautiful, I like visit for a couple of days and more on! Other things you could do in Rome, visit the Vatican, Museum (I burst into tears when I saw the Sistine Chapel when I had studied abroad in Florence), St. Peter’s Basilica, see the Catacombs, tour the Colosseum, and if you are lucky- hear the Pope speak! On our last day we woke up super early and had an uber take us to the airport. We boarded our plane and safely made it back home. I was beyond excited to see Pat and Ruby and was so excited to share my trip with family, friends and all of you. I hope you enjoyed my photos and recaps, I hope you are able to visit Italy one day, it is the most remarkable place I have ever been.